Anyone who enjoys dim sum usually knows what chee cheong fun is. 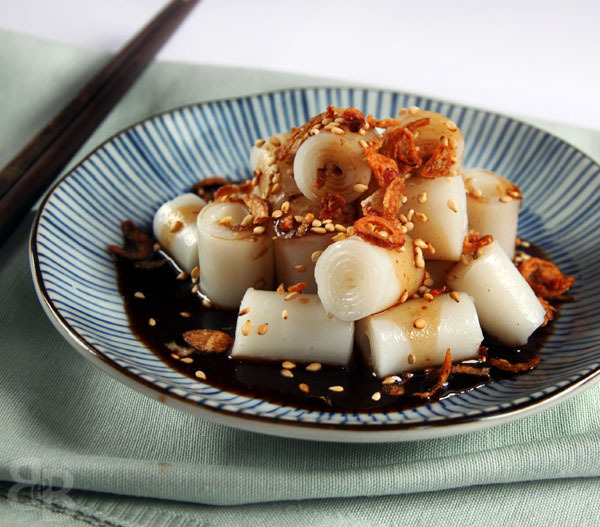 Chee cheong fun is essentially steamed rice rolls (either filled or unfilled), served with a sweet/savoury sauce. The ‘Cantonese’ version of chee cheong fun is usually filled, be it with prawns, char siu (Chinese BBQ pork), fish, or yu tiao (fried dough sticks). It is usually served with a simple soy sauce. On the other hand, the ‘Malaysian’ version is usually unfilled, and is served with sesame seeds and a slightly sweet sauce that is made from hae kor (prawn paste). When I was growing up, I always preferred the ‘Cantonese’ prawn filled chee cheong fun, simply because they were harder to find where I lived. Do bear in mind that this was in the 1990s/early 2000’s, and things might well have changed now. But since coming to England, I now prefer the unfilled chee cheong fun – partly because it is now the more ‘elusive’ version. I really do seem to enjoy making life difficult for myself, don’t I? I’d seen a number of recipes for chee cheong fun on other blogs, and bookmarked them knowing that I’d have to try to making them at home, because I was curious about how they’d turn out. I’d heard that it was notoriously difficult to get thin sheets of the rice mixture, but as they say, you don’t know till you’ve tried it. And now, having attempted making homemade chee cheong fun, I can concur and say that yes, it is really difficult to get thin rice sheets. I steamed my rice mixture on a plate, and although I thought that I was using a very minute amount of mixture… I was wrong. My chee cheong fun turned out at least double (if not triple) the normal thickness of chee cheong fun! Having said that, it was still delicious. Just a little on the thick side though, which as any dim sum loving person will tell you, just doesn’t cut it. Restaurants normally steam their chee cheong fun on large pieces of muslin cloth placed on a special tray with holes, which helps to achieve the ‘barely there’ paper thin rice rolls. I presume that one should be able to replicate this by using a muslin cloth placed on a pizza tray (which has holes in it), but unfortunately my pan isn’t large enough to accomodate my pizza tray, so I guess I’ll never know! I made my chee cheong fun sauce from a very ‘estimated’/’agak-agak’ recipe. This essentially means I added in ingredients as I tasted the mixture, trying to get the sauce as close as possible to the version I grew up eating. The recipe below is a rough estimate of ingredient quantities, I suggest that you taste the sauce as you go along to adapt it to your preference. 1. Sift the rice flour, wheat starch, and cornflour into a large bowl. 2. Slowly add the water to the flour mixture, whilst stirring the mixture with a spatula. 3. Add the oil and salt, and mix until it forms a smooth mixture. I sieved my mixture to ensure there were no lumps. Leave batter to rest for an hour. 4. Make the sauce for your chee cheong fun whilst the batter is resting. To make the sauce, mix the soy sauce, kicap manis, hae kor, water and sesame oil together, till it forms a smooth paste. 6. Grease a pan/tray/plate with oil, and pour approximately 1/4 cup of batter into the pan/tray/plate. (I used a 20cm plate – you may need more or less batter depending on the size of your pan/tray/plate.) You are aiming for a very thin layer of batter, and you should be able to see the surface of the pan/tray/plate through the batter. Steam for 3-4 minutes. 7. Remove the steamed rice roll sheet from the pan/tray/plate, and roll it up to form a ‘swiss roll’. Repeat with the remaining batter. 8. Serve your chee cheong fun with its accompanying sauce, topped with a sprinkle of sesame seeds. They still look amazing, can’t tell it’s double/triple times thicker! Well done. Aww thanks! It was a fun experience, but if I ever make them again I’d want to try it with muslin cloth to see if I can get it thinner! During my primary school years, the canteen would serve CCF rolled up like yours here.. Brings back memories.. I do however prefer the filled versions.. Try wrapping yao zhar kwai with CCF? ?? Yeah they do that here, quite easy to find. But I’m one of those ‘hard to please’ people, I want what I cannot find i.e. the simple rolled kind. Lol. I love love chee cheong fun! I haven’t had this unfilled cheong fun for a long long time! I know what you mean – I usually only get to eat it when I go home! Though Pearl Liang does a decent plain chee cheong fun, which is quite close to the Malaysian version.. I always order it when I eat there. you are the most talented person EVER. I dont think that many people attempt the chee cheong fun skin at home! it’s so hard to get it thin and even WITHOUT breaking. Looks delicious and I STILL MISS YOU! But mine is so un-thin! 😛 I miss exchanging food with you, and more importantly our chats!! Boo. The photos looks so wonderful – I like the stripes on the plates! I wish I had a plate to eat up – the sauce looks so good! This looks amazing. I love your blog. I love you post. It described exactly how I feel when I was making my own chee Cheong fun. I live in Tasmania so getting these ingredient 10 years ago was not very easy. But things have changed. I hope to try again but being pregnant I just can’t bring myself to being active in the kitchen and then may be feeling disappointment. As you know, being away from mother land the craving is high. Thank you for this post. By the way what is wheat starch? Can you get them from supermarket or only Asian grocery? Do you know what they called in Cantonese? A slightly belated reply.. I usually get it from Asian supermarkets. I think it’s called tang mien in cantonese.